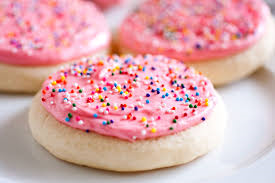 Super Duper, Spontaneous, Simple, Spectacular.... SUGAR COOKIES! This week I am going to show you a super duper, spontaneous, simple, spectacular... sugar cookie recipe! This recipe is from scratch and is a vey easy, everyday recipe you could use. Let's get started. That was my super duper, spontaneous, simple, spectacular... sugar cookie recipe! I hope you love the recipe. Have fun making your cookies. Please comment how your cookies turned out!